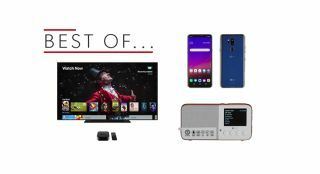 Best of the Week: Sonos Beam, Apple 4K TV with Dolby Atmos, LG G7 ThinQ and more | What Hi-Fi? This week the kings of multi-room audio announced a new voice-controlled soundbar called the Sonos Beam. Marantz unveiled its limited edition SA-KI Ruby CD player and PM-KI Ruby amplifier and Apple announced that its 4K TV streamer will have support for Dolby Atmos in the near future. This week's review highlights include the LG G7 ThinQ smartphone, Pure's Move T4 radio and the squeezable HTC U12+. It's also time for a new issue of What Hi-Fi?. The July magazine is now on sale now and it's a tribute to vinyl, the format that refuses to throw in the towel. There's plenty of reviews of turntables, cartridges and features on how to get the best sound from your set-up. You can subscribe or buy the latest issue here, or buy the digital edition on iPhone, iPad, Android devices or Kindle edition. MORE: July 2018 issue on sale now! Sonos promises that the Beam, its latest soundbar, will combine voice control, compact build and access to all a variety of streaming services in one box. It's 60 per cent smaller and 20 per cent shorter than the Playbar, and you will be able to add extra Sonos speakers to complete a surround sound set-up. It goes on sale on 17th July for £399 and is available to pre-order now. Ken Ishiwata has been part of the Marantz brand for forty years. The Japanese manufacturer is celebrating the landmark relationship with a CD player and integrated amp. Both the SA-KI Ruby SACD/CD player and PM-KI Ruby amp will have a limited, one-off run of 500 units this year. The first 200 buyers of both are promised matching serial numbers. They'll be on sale in September for £3500 each. Apple announced that its 4K TV streamer will feature support for Dolby Atmos. The object-based surround system is expected to be added in September, as part of the forthcoming tvOS 12 update. Once it's out, the Apple TV 4K will be the first and only streaming device compatible with Dolby Atmos and Dolby Vision HDR. "There’s no doubt this phone is pointing the way to a futurist, connected tomorrow"
On the surface LG's G7 is your standard Android smartphone. Under the hood, the South Korean company has implemented its ThinQ artificial intelligence. The phone boasts solid build, very good sound quality and a headphone jack. Apart from Samsung's behemoths, it's as good as any Android phone currently on the market. "This gives you access to radio without eating into your mobile device’s data"
The T4 is a nifty little effort if you're looking for a radio you can take with you that comes with Bluetooth streaming. For a small unit, it was never going to belt out a massive sound, but it is very clear. It's easy to use and Bluetooth adds to its versatility. It's on the pricey side compared to wireless speakers around the same price. But it does what it does with little fuss. "Its quirky features and good camera are great hooks for customers wanting something a bit different"
The U12+ continues HTC's trend of improving usability, rather than chasing specs. Its a return to the squeezable design idea of the U11. It works well, though the phone can be sensitive to accidental presses. Otherwise, it's what you'd expect from a modern Android handset. Speedy performance a good camera and plenty of useful features.